Haller peeps! Are you here to find out the new fashion in 2 to 3 months time? I guess it's my job to share to you, the little idea I know from reading fashion mags and internet browsing. Anyway, it's that time again when your winter favourites feel suddenly outdated, and your look that felt so perfectly on trend pre-christmas is inexplicably in need of an update - fast! So if you want new look that won't break the bank this month, try this new short statement heel shoe -boot, £115, by Topshop. How about this multi coloured woven ankle boot? For only £715.00 from Balenciaga. I think most women like not only the fabulous style but also the very femenine colour which are Beige, pink and white multi coloured woven ankle boot. Buckle fastenings sits on one side of the ankle. High pink metallic heel. This stunning ankle boots with exquisite detail, wear with everything and anything these shoes need to be shown. It's 100% Leather too. What more could you ask? Or if your prefer a fliflop then this White tie up flip flop is a great one. With a black heart sits in between the toes. Gold leather string tie around the ankle, it would definitely rock your world. 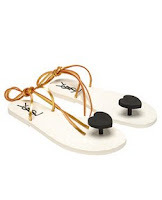 For Flip flop fantastic, perfect beachwear with that extra bit of glamour. Plus, a 100% Plastic, Heart detail and Leather straps that makes this flip flop so cool and unbeatable. For only £105 at Yves Saint Laurent.